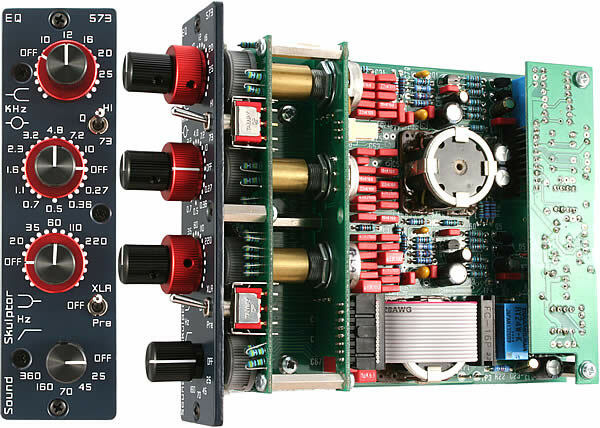 The EQ573 is an equalizer based on the design that was originally used in the Neve 1073 and 1084 modules, that has been adapted to the '500' format of API*. The EQ573 is an parametric equalizer based on the design that was originally used in the Neve 1073 and 1084 modules, that has been adapted to the '500' format of API*. The EQ573 can be used as a standalone unit but also as an insert, between the input and output stages of the MP573 mic pre, recreating the full architecture of the 1073. Just install it in your API* compatible LunchboxTM rack and start recording. You bring the solder (use good quality solder, 1mm diameter max) and the Lunchbox. The EQ573 kit is a rather complex build because of the high components density. The XT500 option is a cable extension that allows you to test and setup the module outside the lunchbox while connected. You get a discount when you puchase it as a Kit option. The 501 case option is a standalone, single slot lunchbox with PSU. The XT500 Extender is not needed with the 501. If you prefer not to DIY, choose an Assembled product. It comes fully assembled, ready to use. For the record, I had never soldered before I bought my first Sound Skulptor kit (CP5176). Also, I am not a trained recording engineer. This is the only Sound Skulptor I would give a 4 (out of 6 I own). What I've noticed after using this for a little over a year is that it can be a bit harsh. I use it more for HF/LF cut, and gentle tuning in the inner frequencies. I run it "inside" of my MP573 (which I love! ), and occassionally in series when I am not getting the results I'm looking for. The build is a little tricky getting the pots and set up straight, but I had a lot of fun learning how this parametric structure works. © 2018 - by Sound Skulptor - All Rights Reserved.